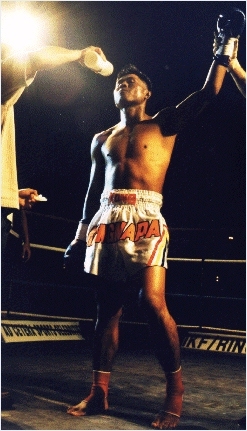 In their Title bout in England in 1998. Muay Thai Cruiserweight Title with the Win. the original Trainer of Dennis Alexio. IKF World Headquarters in Newcastle, CA, USA. eventually moved back up to Super Heavyweight before he retired. won both match-ups by unanimous decision. Light Middle, Middle and Super Middleweight. IKF Pro FCR Middleweight World Title later. pause for a picture at an IKF event in California USA. take time out for a photo in San Jose, California..
World Muay Thai Cruiserweight Title in England in 1998.
and IKF Champion Toney Hannon. of Vacaville, California USA in March of 1999.
pause for a picture at an event in San Jose, California.